HD Video, AVCHD Video Converter, m2ts Converter, Convert AVCHD m2ts, mts, m2t files. Raize HD (High-Definition) Video Converter is a powerful video converter that lets you convert HD video including m2t, m2ts AVCHD video to popular PC video formats which can be supported by Microsoft? Movie Maker, Windows? Media Player or Adobe? Premiere Pro. Raize HD Video Converter converts your HD video files to AVI, MPEG, WMV, DivX, Xvid, MP4, 3GP and MP3 format. Raize HD Video Converter also supports converting most of video formats to HD video format, such as WMV-HD, MPEG2-HD, DivX-HD, Xvid-HD, MPEG4-HD, H.264-HD(AVCHD). This solution makes it possible to watch high definition movies in 1280x720 (720p) or 1920x1080 (1080p) resolutions on your personal computer, PS3, XboX, Apple TV and other devices. Despite Raize HD Video Converter is an all-in-one video tool, but we provide an every easy to use interface for both of new and advanced users. With only a few clicks, you will be able to complete the conversion. The build-in powerful decoder and encoder make Raize HD Video Converter the fastest HD video converter in the world. Raize HD Video Converter has not only the ability to let convert HD videos to SD (Standard Definition) format, but also the ability to convert SD to HD which including MPEG2-HD, WMV-HD, MPEG4-HD, H.264-HD and more. 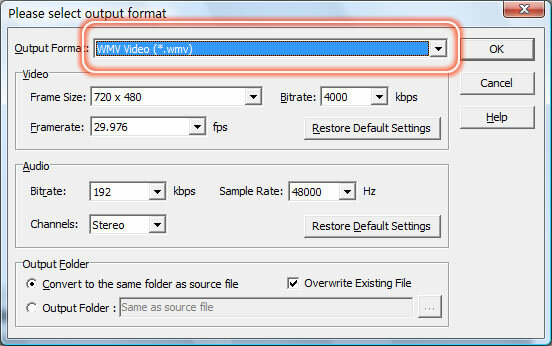 You can set parameters of the video and audio, such as video size, bit rate, or frame rate, etc... You can also use the default settings. Support converting multiple files at one time, and allow you to load all video files, then click "Start" button to convert them at one time. This AVCHD video converter allows you to convert AVC-HD video to AVI, DivX, XviD, WMV, MPEG-1, MPEG-2, MP4, 3GP, MOV, VOB and MP3. Convert m2ts files from your HD camcoder to popular video formats, which can be played or edited on Windows Media Player, Windows Movie Make or Adobe Premiere Pro. You can also convert m2t files to AVI, DivX, XviD, WMV, MPEG and more formats. Convert mts files to AVI, DivX, XviD, WMV, MPEG-1, MPEG-2, MP4, 3GP, MOV, VOB and MP3. Raize HD Video Converter lets you convert HD videos to SD (Standard Definition) or lower, such as AVI, MPEG, WMV and more. Convert popular video format including AVI, MPEG, DivX, XivD, MOV to WMV-HD format. Convert AVI, DivX, XivD, MPEG, MP4, VOB, MOD, MOV to MPEG-2-HD format. Convert your favorite video files to DivX-HD format. Convert video files from AVI, MPEG, DivX, XivD, ASF, VOB, MOD, MOV to XviD-HD format. Convert AVI, MPEG, DivX, XivD, MOV to MPEG-4-HD format. Convert all video formats to H.264-HD format.